The Bamber Bridge-based shale gas exploration company had applied to drill and test frack four wells in a farmer’s field at Roseacre Wood. It had faced strong local opposition and ended up being the subject of two planning inquiries. But now Secretary of State for Communities, James Brokenshire, has ruled that road safety issues posed by HGVs using narrow country lanes that cyclists, walkers and horse riders use, had not been resolved. Lancashire County Council had initially refused the application in 2014 and it had been turned down by parish and Fylde councils but Cuadrilla appealed and a six-week planning inquiry at Bloomfield Road in spring 2016 confirmed that decision. But the then Secretary of State, Sajid Javid, asked for a second inquiry and said he was minded to allow the drilling if traffic safety issues posed by HGVs using narrow country roads could be overcome. A second planning inspector, Melvyn Middleton, examined the case again in 2018 with Cuadrilla proposing to split truck movements to the site across three routes including the nearby MOD site at Inskip. His report went to the Secretary of State and he has now issued a decision. A lengthy document from his department states: “The proposed development would have a serious and very significant adverse impact on the safety of people using the public highway. “He considers that it is not possible to conclude that the demonstrable harm associated with that issue would be eliminated or reduced to an acceptable level. “He considers that highway safety issues carry very substantial weight against the proposal, and given the potentially very serious consequences. However, the decision document said that other concerns of the community, on tremors, noise, pollution and visual impact of the site could have all been managed. A spokesman for Cuadrilla said: “We are naturally disappointed about the decision on Roseacre Wood and will examine the details in full before reaching a position. Jamie Peters, campaigner for Friends of the Earth, said: “This is fantastic news which will be a huge relief to Roseacre residents. It’s also a triumph for the tireless campaigners who have worked long and hard for this outcome. 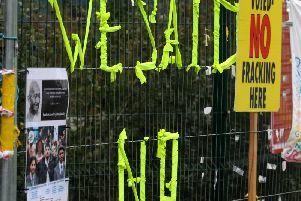 “But many other communities across England are still faced with the threat of fracking – the government must also listen to them and accept that this industry is unviable. Barbara Richardson from the Roseacre Awareness Group, which has opposed the plans to frack for gas on the Fylde, said people in the area were in tears of relief on hearing the news. She said: “We are delighted and relived but we hope that Cuadrilla do not try any further appeals. This application was rejected at every level by over 90 per cent of local residents, town and parish councils, twice by Fylde Borough and Lancashire County councils, by the original Planning Inspector and even two local conservative MPs. “Our community has spent five years, thousands of man hours and tens of thousands of pounds, producing evidence supporting LCC’s decision to refuse planning permission. “This has caused considerable stress and anxiety, residents have shown great determination and resilience in trying to protect their communities. Wyre MP Ben Wallace said: “I am delighted that after strong representations by the local community and me, the Secretary of State has blocked the new fracking site at Roseacre. It was always in the wrong location due to the impact of traffic and I hope now my constituents can rest at ease. Fylde MP Mark Menzies said: “It was clear from the outset that these particular rural roads were in no way suitable for the safe development of a hydraulic fracturing site. Fracking firm Cuadrilla said it spent nearly £2m in the Lancashire economy received during the final quarter of 2018. It said the spend came when the first hydraulic fracturing into shale rock took place in the UK for seven years. Data from Cuadrilla’s latest Putting Lancashire First tracker revealed that direct spend with suppliers in the county soared to £1.8m during the three months to 31 December. The amount of money suppliers sub-contracted to other businesses in Lancashire stood at £188,000. Jill Overland, finance and business services director at Cuadrilla, said: “The final quarter of last year was a landmark few months for shale gas exploration in the UK, with the first hydraulic fracturing taking place in horizontal shale wells at our Preston New Road site. Since the tracker was launched in 2016, Cuadrilla and its Lancashire suppliers have invested more than £13m into the local economy and some 765 local businesses have registered their interest to supply the county’s nascent shale gas industry via the Supply Chain Portal hosted by two local Chambers of Commerce. Babs Murphy, chief executive at the North and Western Lancashire Chamber of Commerce, said: “We’re pleased to see that Cuadrilla is investing significantly into the local economy and that Lancashire businesses should benefit from first-mover advantage as the industry develops.